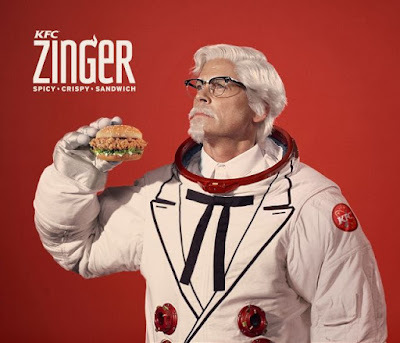 With the launch of the new Zinger spicy chicken sandwich, KFC hires yet another actor to play their iconic Colonel Sanders. This time around Rob Lowe (of The West Wing and Parks and Recreation among others) gets the nod to don the distinguished white (astronaut) suit and mustache. The idea, with the astronaut and what not, is that since the Zinger is already "world famous" (it's been available in many-a-KFC market internationally for some time, just not the US until now), they're going to launch it into space (and the launch it in the US as well).